Ellen J. Stockstill does not work for, consult, own shares in or receive funding from any company or organization that would benefit from this article, and has disclosed no relevant affiliations beyond their academic appointment. If you’ve been on Facebook, Twitter or Instagram over the past month, you’ve probably come across a Mannequin Challenge video, in which people strike a frozen pose as Rae Sremmurd’s “Black Beatles” plays in the background. The camera surveys the motionless landscape, building suspense as viewers take in a scene in which life has eerily stopped. A group of Florida high schoolers made the first video in October, and they ended up starting a movement that went viral, with Steelers fans, Medal of Freedom winners, Pearl Harbor survivors and government employees jumping in to make videos of their own. In the case of the Mannequin Challenge, there’s actually some historical precedent. Long before smartphones filmed the stiffened appendages of people seeking internet fame, striking a pose was a popular form of entertainment in Victorian England. They called them tableaux vivants (literally, “living pictures”). 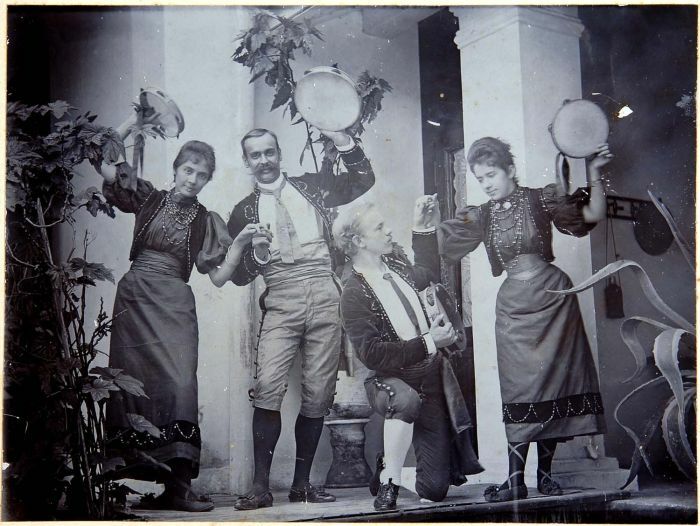 The technique has its roots in medieval drama, but it became a fashionable Victorian-era dinner party game similar to charades. People would select a famous scene from history or literature or art and position themselves in that scene, frozen, for their guests and friends to observe. One fashion and etiquette writer known as “The Lounger” described tableau vivant as the perfect party game. The Lounger’s description of the tableau’s compelling combination of animation and control, its carefully choreographed suspension of movement, also aptly illustrates the appeal of the Mannequin Challenge. The pregnancy of the moment captures the attention of the viewer, who wonders whether Bill Clinton can really stand still that long. The Mannequin Challenge made it to Hillary Clinton’s campaign plane. Queen Victoria and her family also loved putting these together. In an 1852 pencil sketch, she drew her six children in a tableau of John Milton’s “L'Allegro” and “Il Penseroso” that they performed for her husband’s 33rd birthday. “It was a great surprise to Albert who was delighted, & could not imagine how it had been so well contrived,” she wrote in her journal. Part of the joy in producing one of these tableaux vivants was watching the audience’s recognition and reaction. And I have to believe that had Queen Victoria owned an iPhone, she would have snapped a glimpse of this moment and shared it on Instagram for the world to see, too.